Developing countries are taking action to try to combat tax avoidance by multinational companies. Zambia and Mongolia have told the BBC they want to stop mining companies shifting profits out of their countries before they can be taxed. Both are major producers of minerals and say they lose billions of dollars a year in much-needed tax revenue. However, the Organisation for Economic Co-operation and Development (OECD) has warned this could be dangerous. The Paris-based developed nations’ club thinks unilateral action by individual countries could lead to a confused, fragmented set of rules with no clear standards. The speaker of the Mongolian Parliament, Mr Z. Enkhbold, told the BBC that Mongolia is cancelling international tax treaties which mining companies had intended to use to take profits from their Mongolian operations tax free. “Tax must be paid where the real business is located,” Mr Enkhbold told the BBC, “not in offshore countries”. A new law in Zambia, which comes into force this month, requires mining companies to bring the proceeds of export sales back to Zambia. Once in Zambia, the country’s tax authorities will scrutinise dividends and other payments to see if they are justified before they leave the country. Guy Scott, Zambia’s Vice-President, told the BBC that his government is losing roughly $2bn a year through corporate tax avoidance. “We are talking a staggering amount of money,” he said. That is more than Zambia spends every year on health and education combined. “You’re talking about pregnant women who haven’t got a clinic they can go to for antenatal care or child health education,” Mr Scott said. Zambia’s new law is designed to increase the transparency of mine companies’ finances. Mongolian officials say they are acting in an attempt to stem large future tax losses in their rapidly growing mining sector. The former director of Mongolia’s Ministry of Finance, Mr B Batjargal, said Mongolia stands to lose around $5.5bn in tax revenue over the lifetime of the country’s single biggest project, the giant Oyu Tolgoi copper mine. “Mongolia’s GDP is now $8-9bn,” Mr Batjargal said, “so it’s almost the same as the GDP of the country”. As future mining projects come on stream, the potential tax losses to Mongolia are “tremendous, unimaginable”, Mr Batjargal said. The greatest threat to Mongolia’s tax revenues is posed by its bilateral double taxation treaty with the Netherlands, signed by the two countries in 2002. Under this treaty, if a Dutch company invests in Mongolia it is entitled to pay dividends back to the Netherlands free of any Mongolian tax. Turquoise Hill Resources, the company which developed the Oyu Tongoi mine, is Canadian. But for tax purposes its investment qualifies as Dutch because it was routed through a Dutch company set up for the purpose: Oyu Tolgoi Netherlands BV. As a result, Turquoise Hill is entitled to receive dividends through its Dutch company, free of Mongolian tax. Records for Oyu Tolgoi Netherlands BV show it has no employees. It is one of over 1,000 similar companies at a company formation service located in a single building in Prins Bernhardplein in Amsterdam. It is not just Turquoise Hill Resources that is using the Dutch tax treaty route, Mr Batjargal said. “Almost 70% of all major foreign direct investments are coming through the Netherlands, as a tax shield,” Mr Batjargal said. 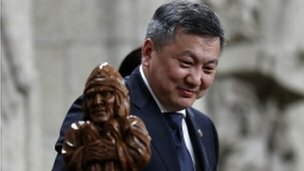 Mongolia is not only cancelling its treaty with the Netherlands, it is terminating three other treaties with Luxembourg, Kuwait and the UAE. They also provide for dividends to leave Mongolia tax-free. After 1 January 2014, the cancellation date of the Dutch treaty, the tax position of the Oyu Tolgoi project is unclear. The London-based mining giant Rio Tinto has bought a controlling stake in Turquoise Hill resources, so Rio Tinto will have to negotiate new ways to get future dividends from the Oyu Tolgio mine out of Mongolia. There are numerous other double taxation treaties between Mongolia and other countries. But these all allow Mongolia to levy at least 5% tax on dividends. The actions taken by Mongolia and Zambia have caused concern beyond their borders. The OECD is now preparing an action plan to tackle corporate tax avoidance to present to world leaders this summer. Pascal Saint-Amans, who oversees tax treaties and international tax negotiations for the organisation, said he regards unilateral actions such as the Mongolian treaty cancellations as “dangerous”. It is a further reason, he says, why the leaders of the countries in the G8 and G20 need to reach agreement on how to deal with corporate tax avoidance when they meet this summer. “If there is no agreement,” Mr Saint-Amans said, “then we’ll have a number of countries walking away from consensus saying ‘I’m not bound by these rules, I will decide on my own’. Meanwhile, the Speaker of Mongolia’s parliament, Mr Z Enkhbold, advised other developing countries to review what agreements they have and decide which to leave and which to cancel. “We need to close this loophole in the world economy,” he said.